Not only is May 6-8 Cinco De Mayo and Mother’s Day weekend, it also holds two great concerts and one special event for the Artesia Arts Council and Ocotillo Performing Arts Center. The first show will be Hotel California, “A Salute to the Eagles,” at 7 p.m. Friday, May 6, and the second is Mariachi Tenampa at 7 p.m. Saturday, May 7. Hotel California was founded with the intent of filling the void left by the demise of the Eagles in 1982. By blending their extraordinary vocal and musical talents, the group faithfully and accurately reproduces the Eagles’ studio recordings while recreating a classic sound that undeniably transcends the boundaries of rock, R&B and country. The band also delivers a modern, action packed performance that brings this timeless music into the new millennium. Audiences can once again experience the energy and magic of this timeless music, particularly poignant this year with the recent passing of Eagles member Glenn Frey. On May 7, continue your Cinco de Mayo celebration with the fifth reprisal of Mariachi Tenampa on the Ocotillo stage. 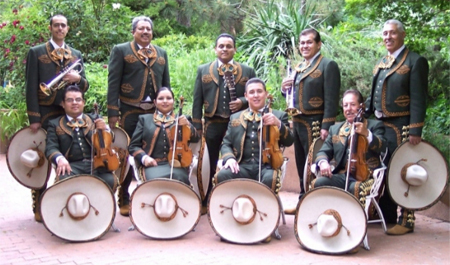 Recognized as “New Mexico’s Premier Mariachi,” the eight-member group’s repertoire consists of well over 400 musical pieces. The audience will hear many styles of music from various regions of Mexico, including sones, huapangos, rancheras, boleros, corridos, cumbias, joropors, and even contemporary classic pieces. Mariachi Tenampa strives for excellence in every performance with a goal of conserving the most beautiful music in the world for future generations. Tickets for Hotel California and Mariachi Tenampa are $35 and $25 respectively. Also coming up May 3, 10 and 17 is a Master Your iPad/iPhone Workshop from 9:30 a.m. – noon and a Like It, Tweet It, Sell It: Internet Marketing Workshop from 6-9 p.m. Whether attendees are just trying to get the darned things to work or wanting to take their iExperience to the next level, the iPad/iPhone workshop offers something for everyone, while the internet marketing workshop will show businesses that while the internet can help connect them with customers around the nation and the world, a little extra effort is needed to really get their names out there. Master Your iPhone/iPad is $129 plus tax and Like It, Tweet It, Sell It $249 plus tax. Those paying for one registration will receive $30 off each additional registration for the same workshop. In addition, a garage sale to benefit the OPAC will be held May 7 at 510 W. Main St.
Tickets for the upcoming shows and workshops may be purchased online at www.artesiaartscouncil.com or at the OPAC box office, open 11 a.m. – 6 p.m. Tuesday-Friday, 11 a.m. – 2 p.m. Saturdays, and two hours prior to every event.